Subscribe Product Releases - Subscribe to receive notices about product updates. Brand new Network Licensing support local, branch and remote network support including disconnected clients. Hundreds of end user enhancements including better instructions, easier navigation, reduced prompts and others. New Feature limit to support named features enabled by serial number or extension code. New Feature Filter limit to enable or disable child limits based on enabled features. New Type limit to filter license support based on licensed type. New Reset limit to reset time and use state based on the success of other limits. Enables renewable grace periods. New State limit to enforce different rules based on the state of other rules. New Remote Desktop limit to control use over remote desktop sessions. New Online limit to enable different rules based on Internet connectivity. Dozens of system stability and compatibility enhancements for CodeVeil. 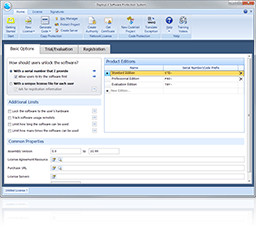 Show license forms at any time to extend a license prematurely, enter a new serial number, activate on demand, etc. This release can be used as a complete replacement for version 3.x. It is backwards compatible except for a few very specific breaking changes. Existing licenses can be validated with the new runtime license without change. License servers upgraded to the new 4.x runtime can validate and authorize 3.x licenses without change. If you purchased on or after Feb 5, 2010 you will receive a complimentary upgrade. Look for an email from us in the next 2 weeks with instructions on how to obtain your upgrade. It's finally here. We've been working hard to improve the developer experience and user experience with the DeployLX suite of applications. Reworked the Network Licensing system. Limit filters to adjust rules based on the state of other limits. Show license forms at any time after validation. Part of the new development efforts involved integrating a bug tracking/feature tracking system into our development process. We tried FogBugz, AxoSoft and finally settled on what we liked best - YouTrack by the same folks that make ReSharper. You can find a complete change log for DeployLX on our YouTrack site. The evaluation version of the 4.0 Beta can be downloaded directly from our site. If you've purchased DeployLX 3.x you'll find the release version of the beta in your account downloads. Pending any major security flaws discovered in the release candidate, DeployLX 4.0 will be released for General Availability Monday April 5, 2010. Maintenance release. Some customers reported receiving Invalid Program exceptions with then encrypted version of the licensing runtime. The fix was discovered some time ago, but applied only to the 4.x release. The fix has been back ported and incorporated into the final 3.x release. See the complete change log. To download the update select Help | Check for Updates in the DeployLX Manager, or visit the My Account section of the website to download authorized installers. This is the final release of the 3.x line and includes a few minor usability enhancements and back-ports of fixes made to the new 4.x beta. Experimental Support for Windows 7. Fixed module load exception in Windows Server 2008 x64 with Kill Debuggers enabled. Improved the Test License feature in DeployLX Manager. DeveloperMode will reset any secure storage tamper detection and will report tampering in the error report. See the complete change log and new xbugz.com site for more details. When an application crashes on Windows 7 where Visual Studio is installed, you're normally prompted to Debug the application (after waiting for it to check for issues :( ). However some applications always get caught by Dr. Watson and never give you a chance to debug. There are a few articles out there on disabling Dr. Watson for XP, but Vista and Windows 7 are different enough that the other techniques often fail to help. On occassion one might have the need to browse .NET's Global Assembly Cache -- to manually update a file during development or to remove an assembly left behind by an installer. Normally you'd use gacutil to add or remove assemblies from the GAC during testing and development. However if the assembly was added by an installer, gacutil refuses to remove it. In the previous post, I showed how to use the Session.Get<T> syntax against an arbitrary property on the entity. The primary limitation with that method is that it only works for constant values. The following will work with constants, local variables, return values from methods, etc. Ever wished you could test the output of your MailMessages without actually sending the message anywhere? You could use the DeliveryMethod of the SmtpClient with SpecifiedPickupDirectory and try and round trip the email through the file system. This is troublesome as you have to remember to delete all the files in the output directory before calling Send, then scan the folder for the new file. It also prevents you from any sort of multi-threaded testing.